As a mom who loves to be creative, and to give something with a little extra meaning, party favour bags (loot bags) stress me out a little. Especially for toddlers, I mean, do they even really need a loot bag? Loot bags seem to be a permanent part of the party culture (at least here in North America) but it doesn't mean you can't get a little creative. Not long ago, Erika from St. John's Kid shared some of her loot bag ideas here on the blog, and I plan to make this an ongoing discussion. Here's a completely handmade favour bag that I experimented with recently - I was really happy with how it came out - part of a fun experiment creating with freezer paper! 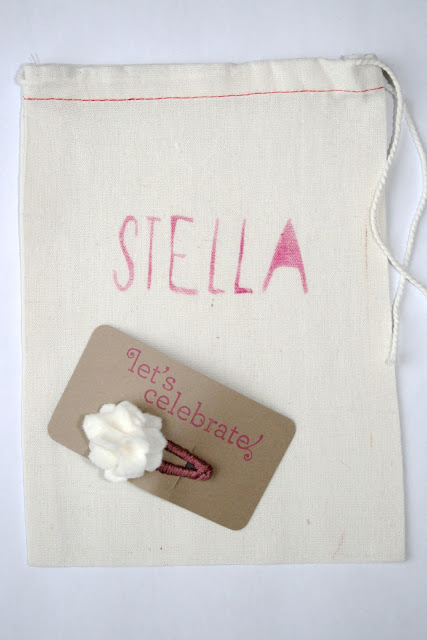 I used a freezer paper stencil to paint this lovely personalized loot bag. I also handmade a little hair clip (wrapped with embroidery thread with a quick white felt flower glued on top) and placed it on a stamped card in a matching ink). The idea for wrapping hair clips in embroidery thread originally came from my Easter post and tutorial and I created the felt flower using this tutorial from shad and lizzie. Of course, you can always forgo favours for really young children and make a donation to charity instead. I did just that for my daughter's first birthday, and I'll share the card that I used in an upcoming post! In the meantime, I've created a board dedicated to creative party favours and loot bag ideas on Pinterest. Be sure to follow for inspired ideas.